A recent post by blogger Dr. David Hone described pterosaur growth patterns (= ontogeny) considering those patterns to be very much like those of mammals and archosaurs (=birds and crocs) in which the embryo/hatchling skull is shorter with big eyes, the bone texture is grainy, the sutures are clearly visible, etc. This is the traditional view upheld by nothing more than tradition. We’ve covered the alternative view, but since this bit of false propaganda hit the ‘Net (again!) its worthwhile to show the data once again. I have abridged Hone’s remarks to save space. The complete text is linked above. If you have a pterosaur specimen in front of you, just how do you know if it’s an adult or not? 1. if you have a pterodactyloid with a 20 cm wingspan then it’s going to be a juvenile, and likewise if you have a rhamphorhynchoid coming in close to the 2 m mark it’s very unlikely to be anything but a big adult. We’ve seen that embryo and juvenile pterosaurs are virtual copies of adults. And this growth trait goes back to the ancestral tritosaur lizard, Huehuecuetzpalli. Moreover, tiny (non-embyro) pterosaurs don’t nest with adults but with other small pterosaurs at the bases of major clades. No one has phylogenetically matched small pterodactyloids to 2x-8x larger adults yet (other than Pterodaustro and Ptweety). Every time that happens, then you’ll have ontogeny demonstrated – and its isometric rather than the traditional allometric. 2. Young animals (and especially very young animals) tend to have big heads compared to their body and especially very big eyes compared to the size of the head. Figure 1. Pterodaustro embryo. There certainly is no short snout/large eye here! 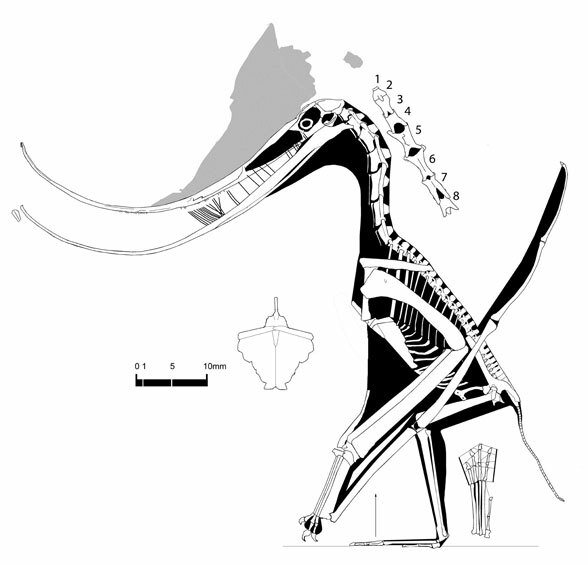 But you don’t find that in juvenile pterosaurs like Pterodaustro (Fig. 1) and the JZMP specimen. Only the IVPP specimen had a short snout, but so did all of its sister taxa among the anurognathids (not the ornithocheirids as originally reported). Only small adults related to other not so small adults with big eyes, especially in the Scaphognathus clade. 3. A bunch of fusions are absent in young pterosaurs that are present in adults too, just as you’d expect for most animals. The sutures between the centrum and neural arch of the vertebrae will be open in juveniles and closed in adults, and similarly the elements of the pelvis and sacrum, and the scapula and coracoid will be separate in young animals and fused together in adults. a) Haven’t seen anything yet on the centrum/neural arch suture in tiny pterosaurs. If you have, please send references and we’ll cover that later. b) The fusion of the pelvis/sacrum and the scapula/coracoid follows phylogenetic patterns, not ontogenetic ones. Maisano (2002) covers this very well as in lizards fusion may occur long before growth ceases or it may never occur, as in certain clades of large adult ornithocheirids and ctenochasmatids. One of the largest pteranodontids, YPM 2501, lacks fusion in the extensor tendon process. 4. Very young pterosaurs also tend to have a very grainy texture to the surfaces of their longbones, despite the fact that even embryonic pterosaurs have a pretty ossified set of bones (unlike many young animals). Interesting conundrum. Embryos well-ossified, but tiny pterosaurs grainy? We earlier discussed the probable short, fast-growth life of tiny pterosaurs, as in other tiny animals (live fast, die young). These tiny adults were rarely smaller than known embryos, all of which would grow to become 8x larger adults that likely lived longer multi-year lives. The grainy texture reflects this fast growth. Tiny pterosaurs, with such little mass as adults, and even less growing up, don’t require the same ossification that larger pteros do. 5. Smaller pterosaurs also tend to have various parts of the skeleton being less ossified and rather amorphous compared to those of adults. The tarsals are often not well ossified and can be missing (well don’t preserve) and if present may be very simple shapes. The carpals tend to look more ‘blobby’ and lack the detailed morphology seen in adults and will be separated into multiple elements whereas in adults the wrist will primarily be formed of just two massive elements (plus the pteroid). There’s no doubt certain clades of tiny pterosaurs have embryonic proportions, but other clades of tiny pterosaurs don’t. Wellnhofer (1970) described missing tiny pedal elements (p3.2, p4.2 and p4.3) in certain tiny pterosaurs, but these were displaced. I found them off to the side. With regard to the carpals, I wonder if some of this lack of detail could be due to geological factors as the joints tend to accumulate obscuring minerals? Often the proximal carpals will not fuse. This can be seen in the presumed adult Germanodactylus cristatus. The distal carpals are not fused in the rather large ornithocheirid Zhenyuanopterus (I drew them fused, my mistake). On the other hand the tiny pterosaur TM 10341 has syncarpals. 6. Rather like birds, in adult pterosaurs the sutures all but disappear, or even go entirely, such that the skull looks like a single smooth piece of bone. This happens in some clades. Not others. Crushing makes it difficult to determine sutures from cracks. And pterosaurologists are famous for ignoring sutures in their reconstructions! You’ll see more sutures at reptileevolution.com. 7. Also as in some birds, bigger pterodactyloids have a notarium and this only fuses up and fully develops in adults. A notarium develops in certain clades and only in the very largest pterosaurs within those clades. So a notarium is both a size and a phylogenetic trait, not an ontogenetic trait. No medium-sized Triassic and Jurassic adult pterosaurs have a notarium. 8. Similar to the point above about absolute size, the presence and development of some form of head crest is indicative, but not a great indicator of age. Yes a massive and elaborate crest in an animal is indicative that it’s an adult, but there could be a fairly well developed crest in an animal that is close to becoming and adult and of course there are taxa without crests and in at least once case it appears that females don’t have crests. Only one embryo/juvenile crested pterosaur is known in which the crest is preserved and its crest (what we know of it) is just as large as the adult. So, at present there’s no indication that long crested pteros produced long-crested embryos and its difficult to imagine this in an elongated egg. Likely crests developed rather quickly after hatching with present data. We await the data on this interesting question. It’s certainly not set in stone yet. 7. As in mammals, but unlike dinosaurs and birds, pterosaur also have epiphyses. The growing plates at the ends of the long bones physically separate the main shaft of the bone from the proximal and distal ends, so things like the femur can appear to be in three pieces. Obviously as growth slows towards maturity these epiphyses slowly disappear as they fuse into the single element that you would expect to see. Lizards also have epiphyses. Hmmm. Wonder why this was not mentioned? In any case, I have not seen epiphyses in any pterosaurs nor have I seen epiphyses in the three well-known embryos. Please send references if available. The epiphyses are seen in living lizards. Summary: As ever with such things these are not absolutes, but merely guides. Good guides, certainly – you simply won’t see a notarium in a very young pterosaur, or open neurocentral arches in a big, old adult. However, in terms of determining more subtle difference in age it will be tricky – one animal may have fused up the notarium, but may have incompletely ossified tarsals and another could have the reverse. Although at least some characters do seem to have a bit of a pattern (the scapulocoracoid seems to fuse pretty early in most things) a general lack of numerous specimens of different ages makes it hard to do any more detailed analysis. Still, in terms of gross age (hatchling – young – adolescent – adult) even for a specimen of a previously unknown species with no obvious close relatives, it should be relatively easy to determine the approximate age of the animal. Yes, there are exceptions. And when you put enough pterosaurs into a phylogenetic analysis, then the exceptions start to form phylogenetic patterns. That needs to be done by someone other than yours truly, and without excluding the tiny ones. Let’s find out if they are indeed juveniles, as Dr. Hone reports without a corresponding analysis, or if they are tiny adults, as the phylogenetic analysis here indicates. Pterosaurs are more interesting, it turns out, than we thought. There’s also a difference between ‘show’ and ‘tell.’ Next time someone tells you the tiny Solnhofen pterosaurs are juveniles, ask him to match them up with their putative adults, if possible. Perhaps predicting frustration may be why nearly all pterosaurologists keep away from the tiny ones. There’s a PhD thesis here for the lucky grad student. Maisano JA 2002. Terminal fusions of skeletal elements as indicators of maturity in squamates. Journal of Vertebrae Paleontology 22: 268–275. This entry was posted in embryo, pterosaur growth patterns and tagged embryo, ontogeny, pterosaur growth patterns by davidpeters1954. Bookmark the permalink. Moreover, tiny (non-embyro) pterosaurs don’t nest with adults but with other small pterosaurs at the bases of major clades. That’s normal! It happens again and again and again and again and again, no matter how certain the identity of the babies as such is. That’s exactly why the anatomy of juveniles must not be taken literally in phylogenetic analyses; you first have to identify them as such before you can add them to a data matrix. There’s extensive literature on this. Why “despite”? Where’s the contradiction between the part before it and the part after it? When the bones start ossifying and when they end ossifying are two different characters, independent except for the obvious fact that the latter can’t happen before the former. References please! I’ve never seen a phylogenetic analysis, other than my own, that included tiny pterosaurs with large ones, or hatchling birds with adults or other large species. David, you’re not looking at the pictures or noting traits, such as pedal element proportions, that indicate closer relations with other small pterosaurs in a gradual decrease and later increase in size along with subtle changes in morphology (=evolution). Let’s solve this problem together! Nor are you taking seriously the work of Reynoso 1998 with regard to the juvenile Huehuecuetzpalli. Nor are you taking seriously the reconstructions of the three known pterosaur embryos, all of which have adult proportions. Many apomorphies only appear at a certain point in ontogeny, so that juveniles have symplesiomorphies that the adults lack and lack synapomorphies that the adults have. It should be obvious that this can throw phylogenetic analyses off. Indeed, Hennig himself famously insisted that only specimens of comparable ontogenetic ages may be used in any one data matrix; when it comes to direct-developing organisms like amniotes, only adults are fairly safely comparable, and even then paedo- and peramorphosis can make otherwise independent characters correlated and again throw everything off. Start at the classic “ontogeny discombobulates phylogeny” paper. Then remember that, difficult though it already is in salamanders, it’s much worse in amniotes, because amniotes lack a clear-cut metamorphosis that would allow you to categorize character states as simply “larval” or “adult”. Off the top of my head, phylogenetic analyses of ceratopsians and I think hadrosaurs has confirmed that juveniles, if their anatomy is taken literally, nest closer to the root than their adults. At the last few SVP meetings, specimen-level phylogenetic analyses were even deliberately used to trace the ontogeny of sexual dimorphism in a few ceratopsian species. Then there are Iberomesornis, Liaoxiornis and Zhongornis: their crucial plesiomorphies were lack of fusion in various parts of the skeleton and a bunch of juvenile proportions. David, you’re not looking at the pictures or noting traits, such as pedal element proportions, that indicate closer relations with other small pterosaurs in a gradual decrease and later increase in size along with subtle changes in morphology (=evolution). Of course I’m not looking at those, because it first needs to be established that the specimens in question have adult morphology! If they don’t, your entire evolutionary scenario comes crashing down – if the graduation is real, it can be onto- instead of phylogenetic. That’s called the slaying of a beautiful hypothesis by an ugly fact, and happens all the time in my work. For testing whether the fossil record of a particular clade is complete enough for various purposes, see my first two papers with Michel Laurin (2007, Syst. Biol. ; 2008, APP); naturally I can send you the pdfs (well, APP is open-access anyway). Let’s solve this problem together! I’m sorry, I’m busy with several other projects. :-( I really can’t work on amniotes anytime soon. The effects of ontogeny on phylogeny, however, crop up in my work all the time and sometimes leave me without a good answer to a specific problem. For my general approach, see my other 2008 paper with M. Laurin (Contributions to Zoology; open access) and my in-press paper with him (Geodiversitas; was accepted months ago, but we still haven’t got the proofs) – however, reading those won’t make sense if you haven’t read “Ontogeny Discombobulates Phylogeny” first. Nor are you taking seriously the work of Reynoso 1998 with regard to the juvenile Huehuecuetzpalli. Beware of circular arguments. Ontogeny evolves; not all amniotes have identical ontogenies. If you think squamate ontogeny is relevant to pterosaur ontogeny, you first need to show either that pterosaurs and squamates are closely related without using any codings that are based on the assumption that their ontogenies are similar, or that squamate ontogeny and crocodile ontogeny are similar enough that (by phylogenetic bracketing, regardless of whether pterosaurs are archo- or lepidosaurs) pterosaurs are expected to have had similar ontogenies anyway. This turns up in my work. Lysorophians have vertebrate-wide indicators of paedomorphosis, like left and right neural arches that are sutured instead of fused. So far, so good. Which others of their characteristics can be attributed to paedomorphosis? Perhaps their similarities to the lissamphibians, as for instance Schoch (2002) has suggested? Well, skull ossification sequences of lepospondyls are completely unknown, except for three stages in the highly derived Phlegethontia which is totally crazy and unlike any other… at least tetrapodomorph in this respect. Lysorophians have a feature or two that would indicate paedomorphosis if we specifically assume a lissamphibian-like ontogeny; but we can’t. Conversely, it has often been pointed out that lissamphibians (salamanders in particular) and branchiosaurid temnospondyls have similar ossification sequences (not quite as similar as sometimes claimed, see Germain & Laurin 2009, but still). Good. See above for what I just said about lepospondyl skull ossification sequences: skull ossification sequences cannot be used to discriminate between the temnospondyl and the lepospondyl hypothesis of lissamphibian origins. Nor are you taking seriously the reconstructions of the three known pterosaur embryos, all of which have adult proportions. Well, you only show us your reconstructions, right? Who knows what you’ve interpreted into your bad photos. That said, David Unwin gave a talk in 2006 on how the limbs of pterosaurs – unlike their skulls – did in fact grow isometrically. But, IIRC, a rebuttal has been published, and I haven’t read it. The embryos tell us how pterosaurs grew. Pterodaustro nested with the embryo Pterodaustro. Also Carr (2005) showed juvenile tyrannosaurines emerge more basally. The whole Raptorex thing is probably an example of this. You’re mixing apples and oranges. Pterosaurs grew isometrically, not allometrically. That’s what the embryos show us. Shake it off and start over with fresh thinking.